Immergiti davvero nelle Blue Mountains in questo tour in corda doppia e canyoning da Sydney. Potrai ammirare da vicino la bellezza naturale di questa regione dichiarata Patrimonio dell'Umanità dall'UNESCO mentre scendi le cascate e salta e scivoli giù per le rocce. L'attrezzatura è fornita, e il tour è adatto sia per i principianti che per gli scalatori esperti. Questa esperienza privata è limitata a quattro persone per fornire un'attenzione personalizzata da una guida privata. Amazing experience. Our guide James was patient very open to customizing our day. I cannot say enough about this day. It was definitely challenging for a novice like me, but definitely achievable. I will remember this for a long time to come and would 100 recommend it to someone looking for an adventure. This was awesome! It was hands down the best activity we did in all of Australia we dove the GBR, did a rainforest tour in Cairns, went to Uluru, climbed the Sydney Bridge, and did the Sydney Opera house tour. 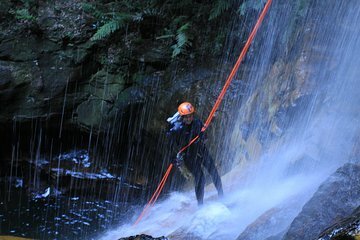 You scale Abseil down a mountain face 600 feet - done in several stages in the morning and canyoning in the afternoon which includes rock jumping, traveling through streams, and finally scaling down a waterfall at the end. My only recommendation is that Viator have more of a description on what to expect on their website. Also, it would be nice to have the contact information of the company on there and information about what to wear we found out after we met the guide that they needed beforehand our information like weight to size us for our wetsuits, but we were never contacted. We found the company's website after the event and it did have information on there. Also, the cost was much higher on Viator then on the company's website which I hadn't seen before.